Comment: Very clean, crisp pages with tight binding. Overall a great copy with minor wear/tear. Ships directly from Amazon! Eligible for Amazon's FREE Super Saver/Prime Shipping. 24/7 customer service and package tracking. There are two ways to teach. One way is to drill information into the listener's head. The other is to tickle it in. West Coast humorist and offbeat motorcycling personality flash gordon, m.d., (yes--that is his real name . . . no caps, please) author of a popular column in San Francisco's CityBike magazine, is a master of the "tickling" school of education. Reading this compilation of his best essays would be a guilty pleasure were it not for the sound information it contains on various topics related to motorcyclists' health. flash's experience as an emergency room doctor and 37-year motorcycling veteran allows him a unique perspective--his suggestions are remarkably insightful, and could even prove to be lifesaving. Ever wonder what to check first when someone has an accident? How about treating road rash properly? Experiencing lower back pain, leg burns, hearing or sinus problems--even hemorrhoids? flash tells it like it is--giving sensible advice about what you can treat on your own and what you can't. Though you may have forgotten everything you learned about first aid and safety in school, you'll never forget it again after reading this book--flash spins cautionary tales that are as easy to remember as a song. The chapter headings may sound wacky, but the tips you'll discover in them will be "anything but:"
Roasting the Fatted Calf (Leg Burns), Here's Lookin' at You, Kid (Eye Injuries), Duh Thrill of Victory, Duh Agony of Duh Feet (Proper Footwear and Footcare), Motoholics Anonymous (Addiction to Motorcycling), Too Cool is Not Too Cool (Hypothermia), "Sh*t, That Was Close" (Adrenaline), That's the Breaks (Broken Collarbones), You Need This Like a Hole in the Head (Sinus Problems), and many more! "If you're a fan of City Bike's motorcycling MD, flash gordon, you'll be happy to know that his columns have been collected and published in book form as Blood, Sweat & Gears. Now you can still have the benefit of flash's wit and wisdom even if you haven't read City Bike from cover to cover for the past ten years. "Quirky, funny, and eminently important for riders and non-riders alike, Blood, Sweat & Gears is a fine read. Written by a funky San Francisco physician improbably, but factually named Dr. flash gordon (yes, lower-case), this work, 'a collection of columns that originally appeared in City Bike, northern California's premiere motorcycling monthly," takes readers through 33 years of riding and decades of doctoring. . . . Yes, flash (lowercase, please) is his real name: it's on the mortgage and his medical license. He's residency trained and board certified in emergency medicine, and has practiced in Miami, Detroit, Boston, Las Vegas, and San Francisco. He's been the director of the Emergency Residency Program at San Francisco General Hospital, a practicing emergency doc, and Medical Director of the Haight Ashbury Free Medical Clinic. He now works in San Rafael, California. 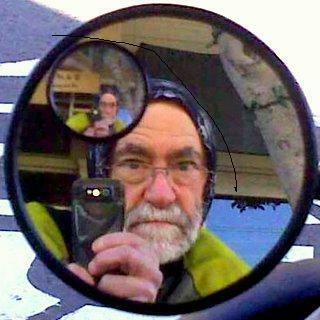 He's been riding motorcycles since 1961, and currently rides a highly modified BMW R-Series Twin around San Francisco. His writing has appeared in CityBike magazine, the Whole Earth Review, a number of nationally distributed motorcycle monthlies, and other publications. Flash is a funny guy, in his own dry humor kind of way. However, if you bought this thinking you would get some medical info, you will be disappointed. The book is barely funny enough, but really short on info. The part on poison oak really wasn't funny as maybe he though it would be either(its not that I was offended, it just wasn't that funny). As a motorcycle instructor and mentorship group ride facilitator I expected a bit more substance. 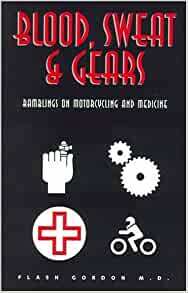 5.0 out of 5 starsBlood, Sweat and Gears - A must read for all motorcyclists! Yes his name is Flash Gordon and he is a medical doctor with some very interesting experiences and credentials. He is also a motorcyclist who rides a fine BMW motorcycle. Doc Flash, like many of us motorcyclists, will use any excuse for a ride and I count him among my favorite riders to look for at rallies and ride-ins. His book is a collection of articles that he wrote for a California based cycle periodical. They are pithy, humorous and are very useful. After reading the chapter concerning what one should carry in their first aid kit, I immediately checked out my kit and realized I wasn't really ready to take care of anything more that a scratch. I have already checked out my local pharmacy for the gauze, ointment and tape I should be carrying. The section concerning what should and should not be done at an accident site is must reading for everyone, not just motorcyclists. This chapter alone is worth the price of the book. As Doc Flash points out those first few minutes at an accident scene can make all the difference in the world. I'm sure my riding friends appreciate the fact that I am better informed and will be able to do the right thing should the occasion arise. Doc Flash has quite a sense of humor and it shows in his writing. Don't be surprised or offended at the language he uses at times. Just his way of making a point. And he does make quite a few points in his articles. The book is easy to read and can be finished in one evening. My wife asked me what I was laughing about several times and when I read her several sections she laughed as well. We both enjoyed the book. I highly recommend all motorcyclists get Doc Flash's book. Entertaining and useful reading.